Sesame mixed with honey, yogurt and a little milk. Sounds tasty, but it is not a feast for the palate, but for your skin. Thai body peeling, thanks to its natural recipe and eastern medical knowledge, will rejuvenate and purify your skin and the subtle massage that accompanies it, will soothe your senses. Why is sesame the key here? Firstly, when it's shredded and used in peeling it acts like grains of sand, or particles contained in peeling gels for the shower. In addition to mechanical properties, it contains sazamol and sazamolin - antioxidants which are known to inhibit skin aging processes. Thanks to the usual, mechanical purification, the skin after the massage looks younger and with regular use it may reduce mimic wrinkles. Additionally the subsequent are being formed much slower. Honey, which is also being used in our Thai body peeling is nowadays often used in conventional cosmetics and medicine. According to research, it helps to fight acne, accelerates wound healing and soothes skin irritations, additionally moisturizing it. Some people use this bear delicacy also for moisturizing dried hair, for smoothing or regenerating cracked skin on feet and hands, which is especially common after the winter season or long summer hikes. Speaking of Thai body peeling as a whole, not individual elements, it is worth noting the effects of combining these few simple and at the same time tasty products, in this case, cosmetics. After just a single session you can see that the skin is visibly nourished, smooth and firm. With regular use, it increases its resistance to bacterial infections while removing toxins at the same time. Over time, wrinkles are reduced, thanks to accelerated cell reconstruction of the largest (surface) organ – skin. THAI BODY PEELING - WHAT CAN YOU EXPECT? The Thai body scrub is divided into two parts. The first one is the peeling itself, which usually takes just over 30 minutes. 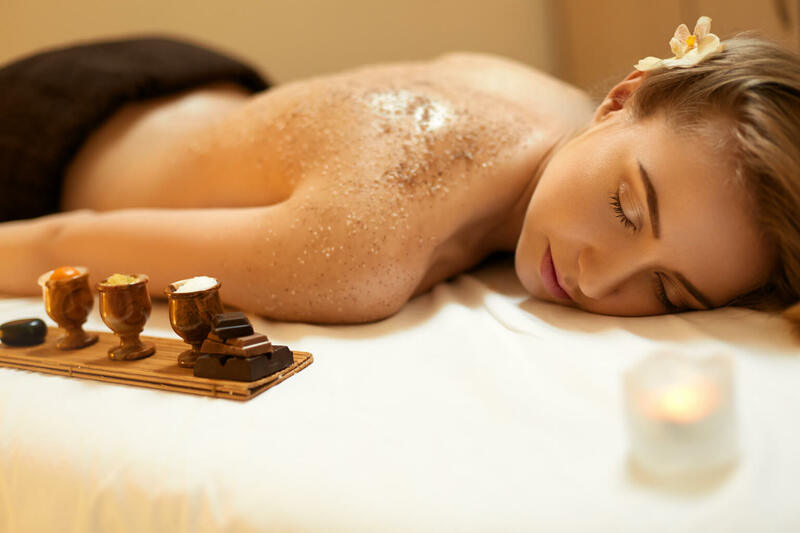 At this time, the masseuse starts massaging the previously prepared mixture of the sesame, honey and natural yoghurt into your body. Dynamic, at the same time relaxing movements are removing cornified layers of the epidermis and minor imperfections. The treatment gradually moves to higher parts, followed by a change of position from lying on the stomach to lying on the back. Then the chest is peeled, the front of the arms, hands and belly. Then a quick break for a short shower to wash off sesame seeds and go to the second part. It is a subtle massage with oils done throughout the whole body. Certainly it will allow you to forget about everything for a moment and also it perfectly moisturizes the skin. delicate, smooth and shiny skin. You do not need to be specially prepared before the massage. You will receive from us a disposable underwear in which the treatment is performed. In case you need a shower, a bathroom and fresh towels await you. First and foremost take care of your time. A Thai body scrub usually lasts an hour, of course it can be extended, which has a logical justification. The skin after the treatment is extremely absorbent for all nutrients. Deciding on a massage with coconut oil, you can relax more effectively and also nourish your skin with one of the healthiest substances currently used in cosmetics and dietetics.